I bitched and whinged about the merits of buying NYX in the US as opposed to the UK, I wonder if my original sums are still at all valid? SmartBeautyShop have now revised their shipping prices to be based on weight. Up to 100g will cost £1.78, over 400g: £2.64 and so on. SmartBeautyShop doesn’t have the Round Lipglosses in stock, so I’ll exclude that item from both baskets. I haven’t included it in the shopping list total, but I also used a 20% discount code… so my eventual bill was closer to £22. Now whilst I’m happy to pay Import Duty… I object to paying Royal Mail an £8 handling fee ontop of this, so I endeavour to avoid crossing the Import Duty threshold which is £18. 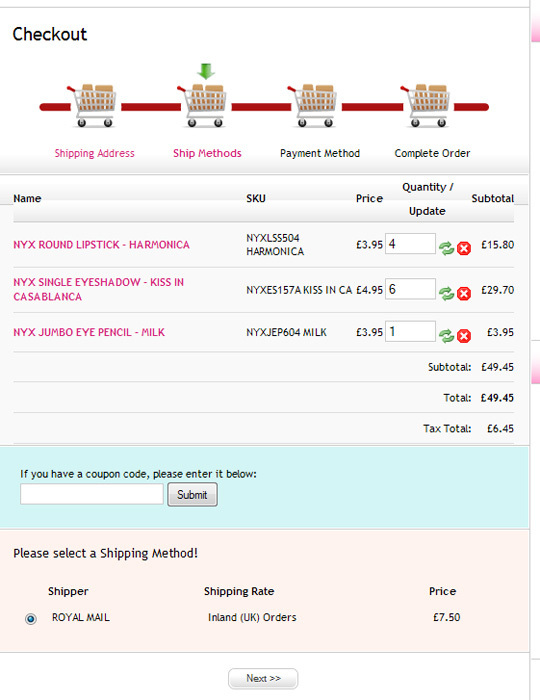 My goods order (inc. lipgloss and discount code) came to: £16.10 so I had a clear margin for exchange rate fluctuation. You don’t include the cost of shipping in the £18 calculation… however, HMRC will include the cost of shipping in calculating the duty to be paid by you if your order value exceeds £18. Does that make sense? It confuses the hell out of me! 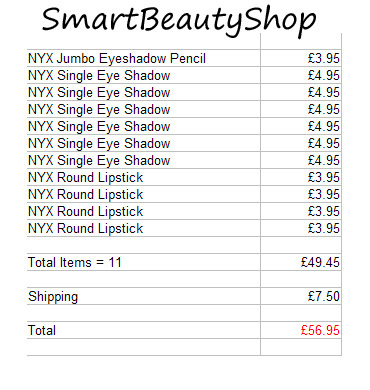 Ok, now that we’re all completely confudgeulated… let’s take the simpler route and shop for NYX in the UK! No, no there it is… 4 lippies, 6 eyeshadows and a Jumbo Pencil… oh and shipping. Wait a minute? £7.50 for Royal Mail Inland postage? But that’s more expensive than Cherry Culture all the way from the US? And I personally consider Cherry Culture to be a little pricey on shipping! Now, I do understand that SmartBeautyShop et al have to mark prices up… of course they do! They’re importing from the US, they’re the middle men… they have overheads that are much greater than Cherry Culture’s. 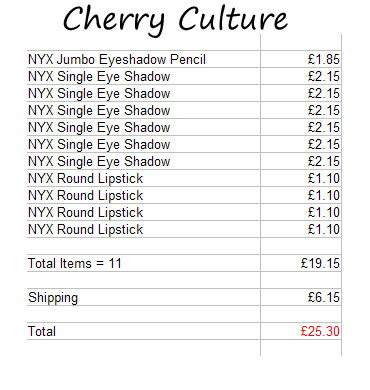 They can charge what they want… but you won’t see me buying NYX in the UK anytime soon that’s for sure. Confusion over international shipping or not… there’s no way I’m gonna justify paying over double for the simplicity of shopping this side of the pond. How about you? Will you be buying NYX in the UK now that it’s becoming more available? Or saving up your pennies for US orders? I went all multi-coloured to show off some new nail polishes! Packaging is quite nice, fairly sturdy, sleek(ish) and nice and compact. On the left is the pan of cream foundation and over on the right is the sponge roller we’re going to be using for application. You can better judge the size of the roller now, it’s actually easy to hold despite it’s small size thanks to some well-designed dips and ridges on the plastic handle. Uh oh, I’m noticing a problem… the product is building up unevenly on the roller. 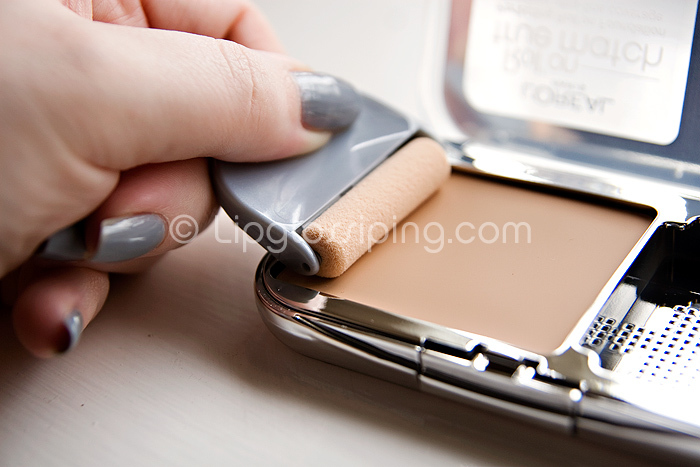 The far edge has a real good coating whilst the rest of the roller remains void of product. After a bit of swiping, direction changing and weight shifting the roller is more evenly covered… but there is still a bias towards that far edge. Will this affect application? Primed and ready for action! 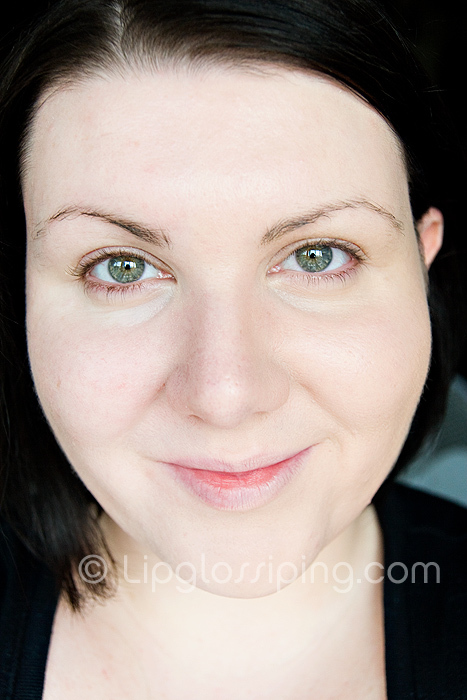 Introducing you to my makeup-less face, not even a smudge of brow powder! Look! I have a go faster stripe! Right, as suspected… not a colour match. Far too warm and a couple of shades too dark aswell. I’ve been tangoed. That’s terrible. 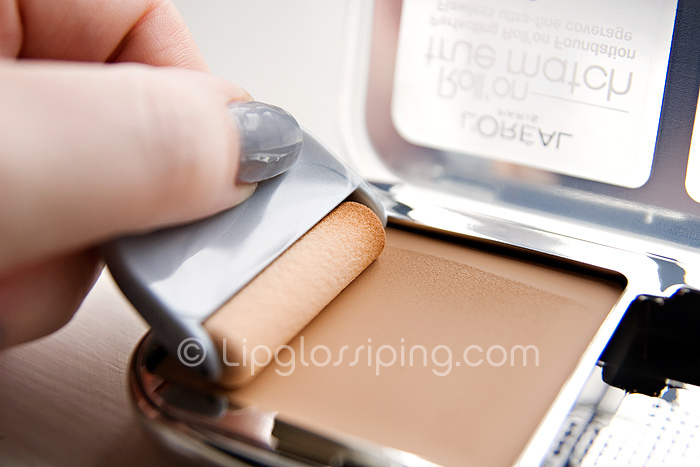 This is the lightest shade that L’oreal are offering (in this country at least) for their True Match Roll On Foundation. 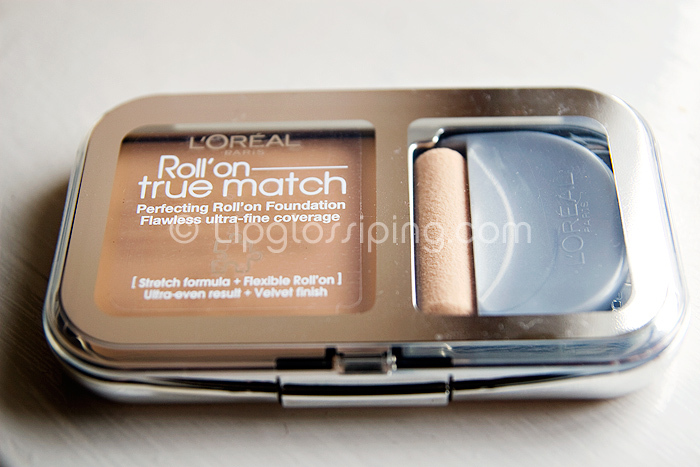 With all the money and technology that’s gone into this product – why on earth did L’oreal make the shade range so limited? I *know* I’m pale… but I’m not Nicola Roberts pale, I see many people walking about even more see-thru than I am. That’s a big chunk of the population not being catered for, and I’m willing to bet the story is the same for those on the other end of the spectrum aswell. One half done (your right). The actual coverage is pretty heavyweight. 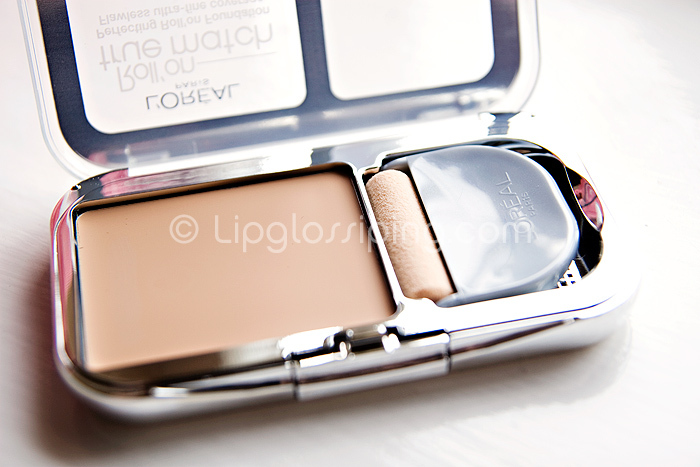 Don’t be getting this if you’re looking for sheer -> medium coverage ‘cos this is full on. You wanna know about the application with that little roller don’t you? It wasn’t as bad as I thought it would be. 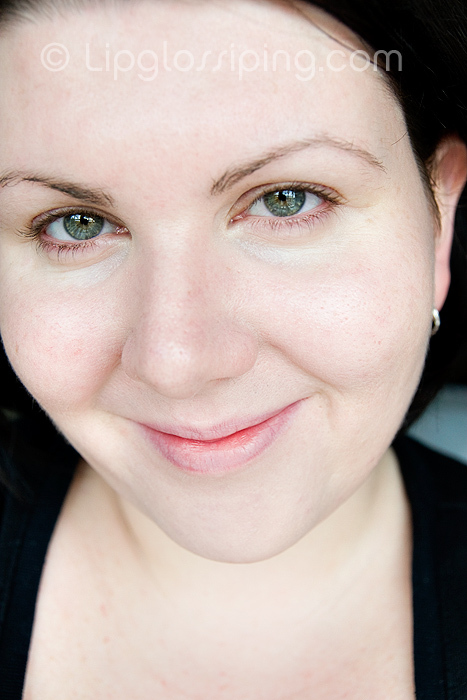 Sure, it’s not gonna get anywhere near the inside corners of your eyes… but I didn’t have a problem around my nose. 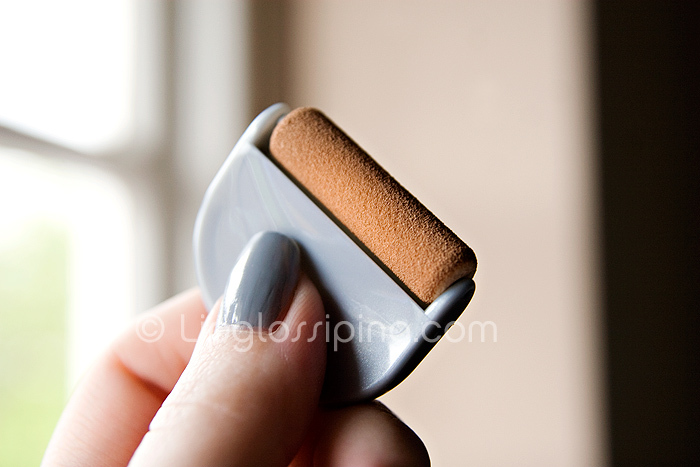 The actual “roller” is slim enough to offer even coverage down the edge of the nose. I also found it a speedy (if a little uncomfortable) process. I blended with my fingers closer to my eyes and I even attempted closing my eyes and rollering in an up/down motion over my eyelids. No, it didn’t work very well and yes, I looked really silly. 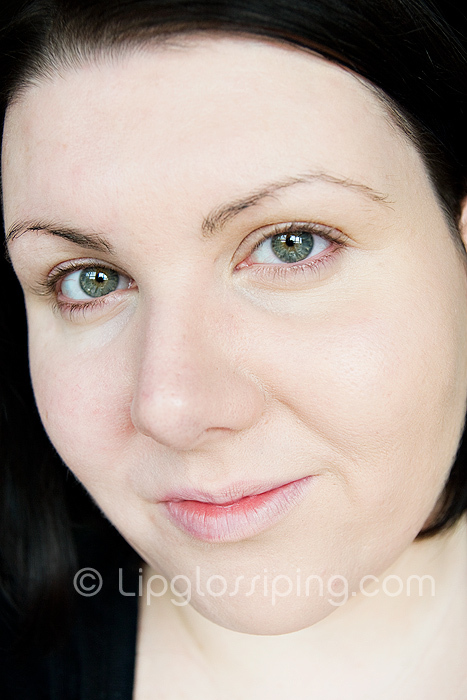 The finish is matte and looks a little deathmask-like to me (perhaps I’m not used to the heavier coverage). I didn’t have any problems with streakiness or patchiness but when I touched my face 5 minutes later, my skin still felt tacky to the touch… it took nearly 20 minutes to dry fully. Your final half n’ half (again, your right has the coverage). What do you think? 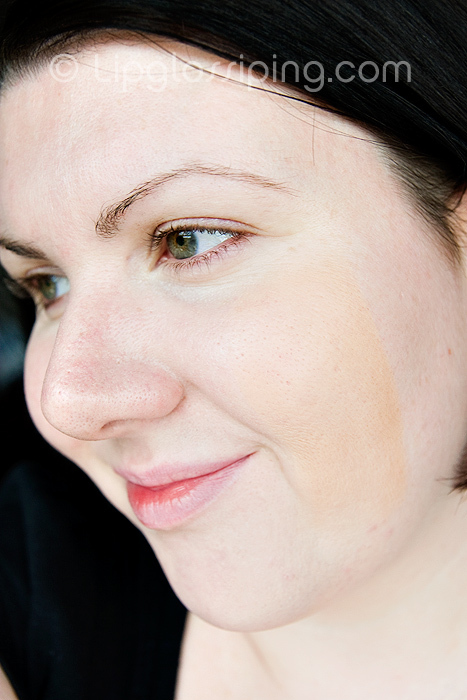 The formula isn’t *so* bad… I did actually prefer it later in the day after it had had time to “fit” to my skin. …Not even with your money. 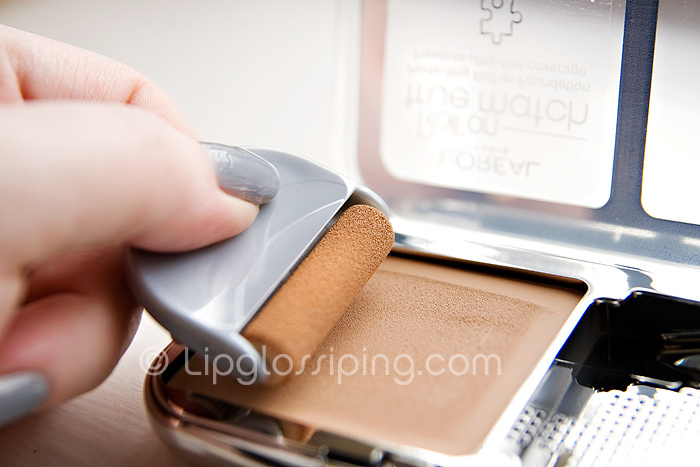 Hmmm while the concept is good, nothing beats a foundation brush. I just cant see that blending very well. Happy blogversary! Great reviews, do keep up the good work! Screw fashion trends, let's talk brow trends!